After the Hawkes Bay earthquake, Red Cross set up an emergency centre at the Central School in Hastings. Red Cross depot set up at Central school in Hastings. Alexander Turnbull Library. The Red Cross flag was raised in the middle of the courtyard as a guide for refugees and rescuers. The centre was set up early in the morning on 4 February 1931 by Major Power and Lieutenant Dickson and in under 72 hours the soup and tea kitchen had churned out 9,000 meals. There were 56 Red Cross volunteers working at the centre making the hot meals and distributing clothing, groceries and other comforts as required. 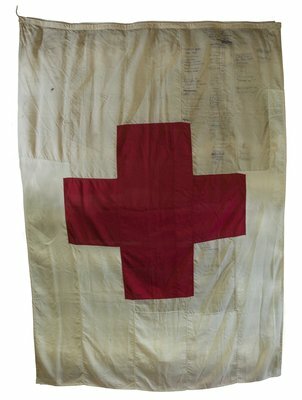 Red Cross Flag. If you look closely you can see the signatures of the volunteers. Feature photo: At Central school, Hastings, the Red Cross flag guided refugees and rescuers to an emergency centre. Alexander Turnbull Library, Wellington, New Zealand, S.C. Smith Collection, Ref: 47685.